322 (24 Feb 1944), 323, 324, 325, 326, 327, 328, 331, 331, 334, 335, 336, 338, 342, 343, 344, 346, 347, 350, 351, 352, 353, 354, 356, 357, 358, 359, 363, 364 (25 April 1945). For Mission dates, targets and Mission Reports, see Combat Missions. 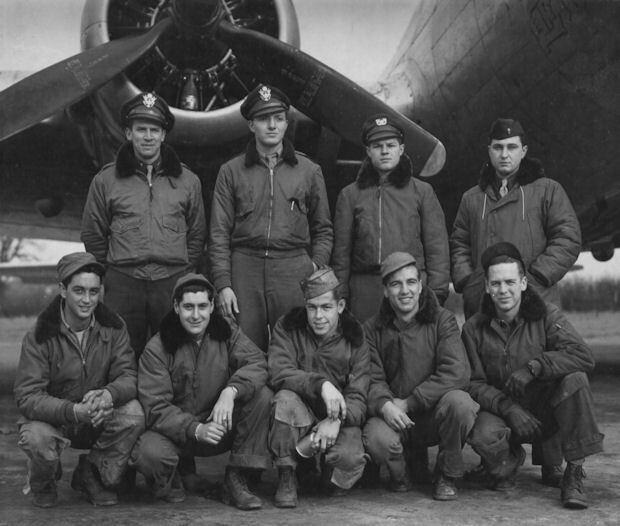 The Lt Bohle Crew had no regularly assigned B-17G and flew thirteen of the above twenty B-17s on only one combat mission, five B-17s twice and two B-17s three times. 2Lt Loren W. Bohle (P) - First two missions (322, 323) flown as CoPilot with combat Orientation Pilots and crews. Two missions (350, 351) flown as CoPilot with his regular CoPilot, 1Lt Joseph Gordon, flying in the left seat as Pilot. All Other missions flown as First Pilot. Completed 29 credited missions on 25 April 1945 (Mission 364). 1Lt Joseph Gordon (CP) - Flew his first 3 missions as a First Pilot (298A, 298B, 324). On mission 324, 26 February 1944, the outbound engine on B-17G Sweet Pea caught fire just before the crew was preparing to drop its bombs. The Ball Turret Gunner reported the situation to the cockpit and was ordered to get out of his Ball Turret. At about the same time most of the bombs were hung up in the bomb bay and wouldn't release. The Engineer and Ball Turret Gunner pried open the bomb shackles with a screw driver and got rid of the bombs. By the time the bombs were released a lot of altitude had been lost, the fire was out, the engine was functioning (later feathered). Sweet Pea became separated from the 358th BS formation and the Navigator reported that they were lost. The Radio Operator got a beam from Rheims, France and the B-17 headed there. The English radio signal kept getting weaker and was finally lost while flying over a solid overcast. It was then decided that Sweet Pea had been flying in the wrong direction and was now well over Germany. The course was reversed and after a while the English radio signal was again picked up. At this time fuel became a problem and a decision was made to put Sweet Pea down whenever a suitable place could be found. Flying through the overcast to about 1,000 feet, a cleared plowed farm field near Tourney, France was spotted where a landing could be made. The Engineer reported that a cockpit confrontation took place between 2Lt Joseph Gordon (P) and 2Lt Neil Cunningham (CP). 2Lt Cunningham took over the controls from 2Lt Gordon and with the assistance of the Flight Engineer, T/Sgt Sprinkles, made a wheels up landing. The frozen earth prevented much of a landing skip. The balance of the crew were braced in the Radio room during the crash landing. The Tail Gunner received a severe head bump but other crewmen were not injured. The crew credited Lt Cunningham with saving the lives of the crew. The Lt Joseph Gordon crewmen refused to fly any additional missions with Lt Gordon and he flew the rest of his missions as a CoPilot. F/O Eugene M. "Bud" Gerhardstein (N) - Flew on 26 missions with Lt Bohle (All missions except 322, 323 and 325). Completed has last mission on 25 April 1945 (Mission 364). 2Lt Jonathan S. Swift (B) - Flew on five missions with the Lt Bohle Crew (324, 325, 326, 327, 328) and three missions with other Pilots (358, 342, 351. Eighth and last mission was on 4 April 1945 (mission 351). Toggliers were used on the remaining Lt Bohle crew missions. T/Sgt Wayne C. Sproule (WG/Tog) - Flew three missions as Waist Gunner (324, 325, 332). Was made the crew Togglier following mission 332 on 10 March 1944, and flew on the crews last twenty mission as Togglier. Completed 23 missions on 25 April 1945 (Mission 364). S/Sgt Robert F. Bigelow (E), S/Sgt Norman Genter (R), S/Sgt George C. Aldous (BTG) and Sgt James C. Smith (TG) - Stood down on mission 322 & 323. Flew on all of the other Lt Bohle missions. with Lt Bohle. Completed 27 missions on 25 April 1945 (Mission 364). F/O Jack Silver (CP) (Not in photo) - Was the original assigned Lt Bohle crew CoPilot when assigned to the 358th BS on 15 February 1945. Flew on two missions as the Lt Bohle Crew CoPilot (327 and 328). He asked for a different crew assignment and was assigned as CoPilot with the Lt Arthur R. Nicolaisen Crew.